British intelligence about the Manchester attacks was published in the American media. Now both countries are dealing with the aftermath. 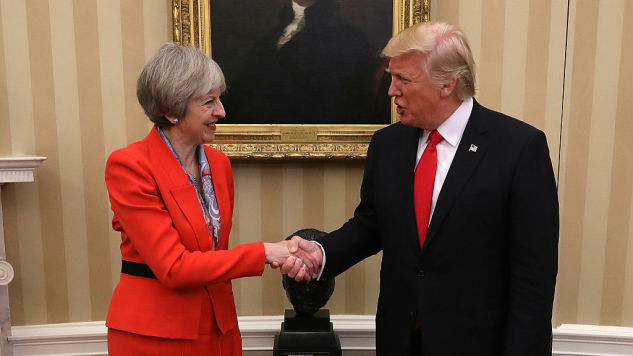 Trump and British Security are the mashup nobody asked for and nobody wanted, but we’re getting it anyway. It’s like the two most dislikable people in high school tying the knot in Missouri. Why, God—and why there? If Trump is horrifically tasteless by the loosey-goosey standards of the New World, consider what the Old Countries think of him. Given the habits of the President, it was inevitable that there would be a leak, and that Trump would denounce said leak. The British are required to have dealings with Donald Trump, and how it must mummify them. The best quality workmanship has gone into making European institutions the kind of triple-padlocked edifices which would repel Trump-like power … much in the same way that everybody avoids the day-drunk and the guy wearing the Members Only jacket at the hotel bar. It won’t do Europe any good now: rich, wild, goofy America chose their prom queen, and so the United Kingdom must follow the U.S., their most insufferable son that isn’t Australia. Intelligence-sharing is the holy beating heart of the Atlantic alliance—not just its heart, but its spleen, and bowels, and other gross analogous organs you can probably think of. The Anglo-American Intelligence community requires a level of catch-me trust between the two biggest imperial powers of the last three hundred years. In the past, no matter how “radical’ American politics got, the partnership remained secure. There was no threat to the settled order of things. It was totally fresh and dope, as we used to say back then. But now there’s a snag. This mutated version of the American government does not take the sharing of information seriously. The Burn Book is no longer secure, like baby teeth in a junior high mouth. It’s amateur hour on the Potomac, and the Tories know it. The guilty whisperer is likely buried in the Executive Branch. That’s a terrifying prospect for the leadership of both countries. That is why Westminster is furious. And it’s why Trump has ordered (and had to order) a leak-investigation by the Department of Justice. The British invented the modern, knife-in-the-back, paranoid style of spying and data-gathering, and here they are having their secrets spilled every which way. Bugger. It is obvious to everyone living in the world (and probably the dead too) how well secrets are kept in the Trump Administration. The President is a leaker, his cabinet is a leaker—his staff, who loathes him, are leakers. Leaks pour from every crevice of this White House, and in the age of information leaking, much that is kept secret soon sees the light. In part this is due to Trump’s own incompetence, and in part due to the time we live in. This is the Golden Age of Whistleblowing. We should be proud of that fact. The issue of leaking illustrates one of the inherent conflicts of the Trump years. The scene of the National Security community being double-crossed and sold should warm the heart. Those of us who want oppressive systems torn down must be conflicted about the spectacle of Trump fighting the shadowy limbs of government. Trump is a man who breaks the rules of the master class; it would be admirable, except he is a thousand times worse than they are. The CIA kills foreign leaders, but Trump might kill the world. The President is not breaking the locks on the intelligence community because he believes in the free flow of information. He is doing it because he is selfish, lazy, and doesn’t understand multi-syllable concepts. In fighting Trump, the National Security community is protecting its own power. The unintended side effect of them safeguarding their own influence is the preservation of democratic norms, which must gall National Security—they generally have no use for open, representative, egalitarian government. Trump, who represents an existential threat to the current global order, makes for odd bedfellows among his opponents. Centrist liberals lionize intelligence agencies, apparently without awareness or shame. 2017 saw Chelsea Manning released and Assange cleared of charges, but it also led to the nauseating spectacle of the National Security community cast as Galahad. The people in the shadows are now looked upon as paragons of virtue and order; as if they were the bedrock of republican government and freedom. The CIA spent the Cold War subverting democratic elections, and now they are lauded for their stewardship of the American Dream. For the record: it is wrong to have edifices of power and secrets and hidden black site locations. Spies are not heroes, but servants of unaccountable powers. And power must always be held to account. If you love the intelligence community, you are no progressive. Trump’s reaction is the least surprising part of the equation. The British face a conundrum. The prime concern in this conflict is over power, and what happens when political might is in the hands of someone you cannot do business with, but must live with. The struggle between Donald Trump’s government and the structures of the Anglo-American national security communities is not a fight of good and evil, but between two predatory systems: incompetent wickedness on one side and reliable tigers on the other. Of course the strife between Trump and British Security occurred over images and data depicting the suffering of innocents. That’s usually what their precious information brokering is about: how effective systems of violence are against ordinary people. The mandarins in the back rooms want to hide everything except their own standings: who has what, and how much influence each party has over the other. They love to shine a light at how well they keep everyone else in the dark.